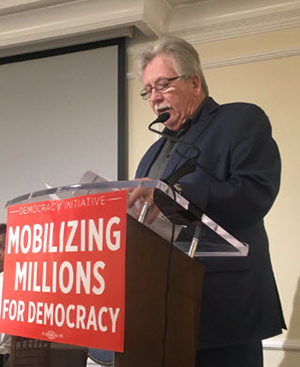 CWA President Chris Shelton speaking at this week's Democracy Initiative Annual Meeting. Shelton highlighted last year's corporate tax cut bill as an example of the "vicious cycle" that locks working people out of the political system. Corporate CEOs were able to funnel tax cut money back into elections in order elect corporate-friendly candidates and secure legislation that increases their profits even more. Breaking this cycle requires a commitment to engaging working people in the fight to get big money out of politics, protecting and expanding voting rights, and ending the obstruction that has thrown our government out of balance. Shelton pointed to the success of CWA's Ending Runaway Inequality training program as one way of tackling these problems. "We've trained over 2,000 activists already, who are working in their communities to hold Wall Street accountable," said Shelton. "This past spring and summer, we targeted Republicans in Colorado, Texas, and Ohio who voted for the tax bill by knocking on doors of voters. We knocked on almost 16,000 doors, spoke to more than 2,300 voters and collected pledge cards from 1,448 voters who committed not to vote for them. Two of these members of Congress are no longer coming back to D.C."
Shelton urged progressives to build on victories like these by fighting every single day for a better democracy that supports a strong working class, a healthy environment, quality protections for consumers, and fierce defense of our civil rights.